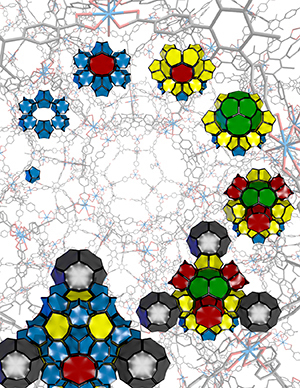 Why It Matters: The intricate properties of MOFs make them building blocks for chemists. Using the blocks, scientists can design sieves or filters to aid in removing pollutants from different sources or aid catalysts that drive the production of plastics and other goods. The problem was that it was incredibly difficult to see the details of the MOFs created in the lab. Previous imaging of MOFs were done using x-ray diffraction, which provides a general overview of the structure, but none of the important details. Models can be used to provide insight on MOF structure; however, they are based off the scientists’ assumptions and can be inaccurate if these assumptions are incorrect. Methods: Scientists shied away from using powerful microscopes to see the structure of the uranium-laden MOF, named NU-1301. A MOF consists of metal ion nodes connected with organic linkers. In NU-1301, the structure is incredibly complex. It consists of 816 uranium nodes and 816 organic linkers. The organic linkers are sensitive to the electron beam, so while electron microscopy would result in a more detailed image, the MOF is damaged or destroyed in the process. Browning and Mehdi, along with their team, used low-dose imaging to take images near the atomic scale. With a scanning transmission electron microscopy process, the team directed a dose of one electron per angstrom squared, equal to 0.1 nanometer, in the MOF, allowing for easy imaging of the metal nodes using the Z-contrast imaging mode. Using this method, the arrangement of thousands of uranium rings can be easily seen. What’s Next? The next step in the study is to grow the MOF inside of an electron microscope to document how the framework self-assembles. In addition, Browning, Mehdi, and their colleagues will continue to examine the complex structures of NU-1301. Sponsors: This study was sponsored by the U.S. Department of Energy, Office of Science, Basic Energy Sciences and Northwestern University. Scanning transmission electron microscopy experiments were performed by BLM, AD, and NDB and were supported by the Chemical Imaging Initiative, funded through Laboratory Directed Research and Development at Pacific Northwest National Laboratory. Using low-dose electron microscopy, PNNL scientists were able to image metallic-organic frameworks down to the atomic level. Using low-dose electron microscopy, PNNL scientists break the bottleneck of imaging complex building blocks.